Buy online 750 sq. ft. Roll of 30# Waxed Paper 70-120 and leave review or share with Your friends. Roberts 30 lb. 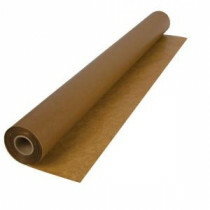 Waxed Paper Roll is recommended for the installation of hardwood and engineered nail-down flooring. The wax paper provides a professional grade thickness and performance to help ease the installation and reduce squeaks in wood floors. The wax paper is simply placed between the subfloor and the wood flooring on above grade installations. Comes in an extra large, 3 ft. x 250 ft. roll for a total of 750 sq. ft. Convenient 3 ft. x 250 ft. roll for a total of 750 sq. ft.